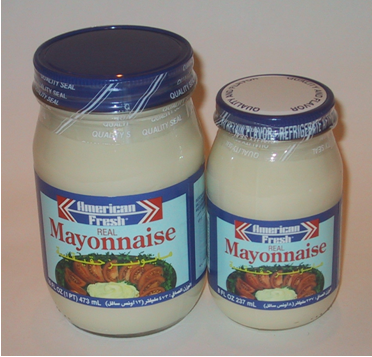 Whenever you need mayonnaise, you will need to look no further than American Fresh Mayonnaise. Our REAL mayonnaise is made with the freshest eggs and finest oils to give it the beautiful color and taste you would expect from a premium mayonnaise. Its unyielding thickness and body holds up extremely well for all your menu needs. We rely on the latest in manufacturing technology and the highest standards of quality. Our ongoing commitment to quality, service and marketing support provides better products to our valued customers. Mayonnaise was invented in 1756 by the French chef of the Duc de Richelieu. After the Duc beat the British at Port Mahon, his chef created a victory feast that was to include a sauce made of cream and eggs. Realizing that there was no cream to be found anywhere, the chef substituted olive oil for the cream and a new culinary creation was born. The chef named the new sauce "Mahonnaise" in honor of the Duc's victory. Mayonnaise is a thick, creamy sauce or dressing that is made of oil, egg yolks, lemon juice or vinegar, and seasonings. Commercial mayonnaise, which will last up to nine months under proper storage conditions, contain (by U.S. law) at least 65-percent oil by weight (except reduced-fat and fat-free mayonnaises). The standard of identity law also requires that all commercial "real mayonnaise" use only egg as an emulsifier. Mayonnaise is used as the base for other sauces, such as tartar sauce and thousand-island salad dressing. Groceries USA is the exclusive export management company handling the international distribution of American Fresh Mayonnaise. American Fresh Mayonnaise offers a 12 month shelf life.